I used to grow one other more nondescript Opuntia, but I lost my text on it. So I will do an edit on this one. I got this Nebraska native and it ranges up into Saskatchewan CA and throughout most of the U.S. 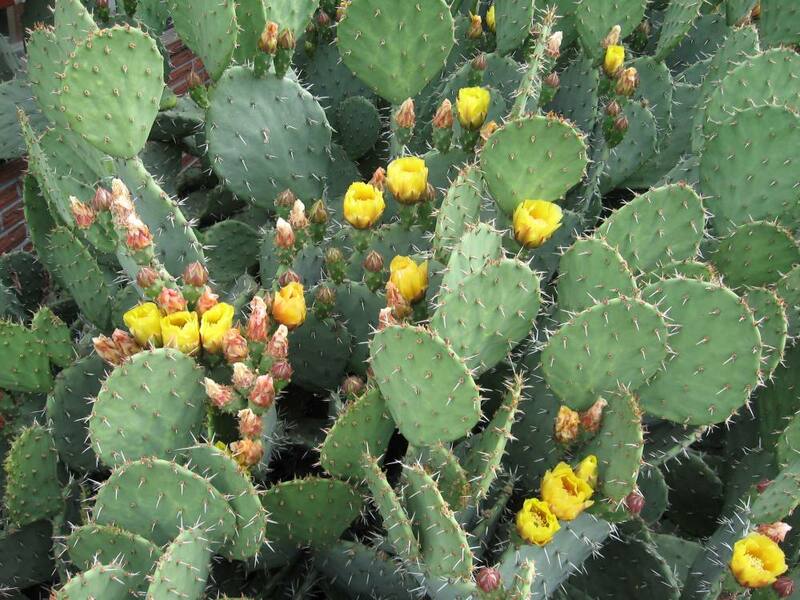 It is totally hardy..
Opuntia fragilis is distributed widely throughout North America. It is the only cactus species native to western Washington. It used to be widely distributed in the areas found within the Olympic Rain shadow. Sequim, Pt. Townsend and the San Juan Islands. In British Columbia, the plants can be found in the Gulf Islands in the Strait of Georgia. 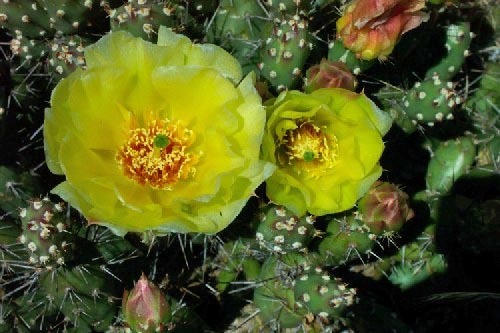 To those familiar with the large, shrub-like prickly pears of Arizona, Opuntia fragilis would hardly be recognized as a close relative of those impressive plants, but indeed it is! 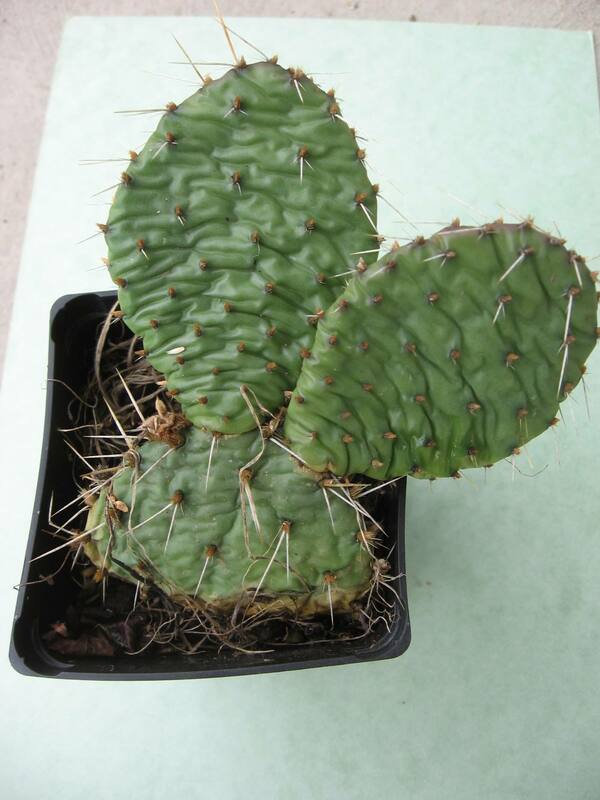 However, it has much smaller pads than most Opuntia species, usually just 1 – 2″ long or occasionally a little longer. The pads are “fat” and can be cylindrical to slightly flattened in shape. Some older references state that the pads are invariably cylindrical, but a thorough inspection of a sample of wild O. fragilis plants will reveal that this definition is too narrow. The pads have spines that may be rather soft and white to more rigid and somewhat golden or brownish in color. The spine color also varies according to the time of year. In June, yellow flowers are produced, but some forms of this species are rather shy to flower. It blooms but infrequently, as its distribution pattern seems to be from broken off pads. This I can attest to, as I battle with crows all the time. These vicious winged devils routinely come down to pull small pots out of their flats, steal the tags and leave them scattered all over. I HATE them! I finally chili powdered all of these flats, and sprayed them with Cayenne pepper as well. They moved on to my Cacti flats, and damn it … they stole a couple! When I told that to a friend of mine, she laughed and said that they had just gotten stuck to their feathers. So off they flew with my little cacti attached and now they assuredly have a new home. This Opuntia is hardy in Zone 7 Sequim, WA. But relishes our dry winters. Sequim, only gets some 15 inches of rainfall a year and happens to be in a mild climate zone. Rarely do we drop down to 10. F. Adding 6 inches of coarse gravel to the potting area would be a good thing to do. Plant under an overhang, facing south. Great protective landscape plant to put under opening windows. PLANTING INFO …… Zones 8 and higher Do check out my favorite indoor Cacti! Hi, I live in Sequim, WA. & am interested in cultivating the Sequim cactus. Do you know where I might find one? Yes, I have plenty in all sizes. Some blooming size. Pickup here only. I no longer ship plants. Not much left of the rest of the nursery inventory – slow selling off as I go. I’m here in Sequim as well. I have a small collection of cactus and would love to add the one or two of the brittle and hardy varieties. So you have any you can part with? Have plenty. All sizes. Very reasonable. Just keep them on the dry side over winter. Under the East side eaves of a house would be great.